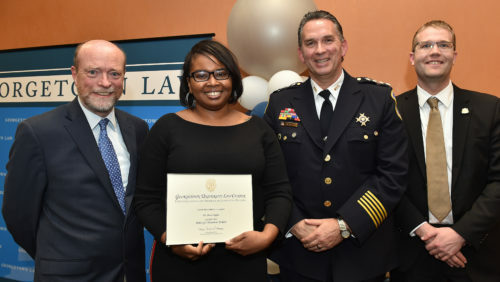 On October 23, Georgetown Law and Metropolitan Police Department's "Police for Tomorrow" Fellowship Program graduated its first cohort of police fellows in a unique program designed to address the challenges of constitutional policing. 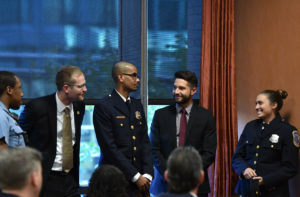 It was the latest roll call for 18 Washington, D.C., Metropolitan Police Department officers and civilian personnel participating in a pioneering Georgetown Law-MPD joint fellowship program — and the first for 26 more set to walk the new beat. 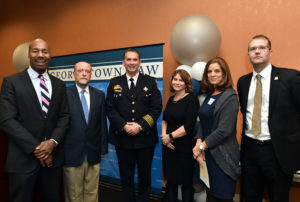 Georgetown Law and MPD celebrated the successful inaugural edition of the Police for Tomorrow Fellowship Program in the Law Center’s Eric E. Hotung International Law Building on October 23. The graduation ceremony recognized 18 newly hired officers and MPD staff who completed a curriculum of in-depth workshops, community engagement activities, and a capstone project — all providing a deep understanding of the community they serve and prepare them to become leaders in innovative policing. The second cohort of fellows has just begun the first-of-its-kind program. Georgetown Law Dean William Treanor said a fellowship like this one is vital: widely reported instances of police misconduct have highlighted the need to address systemic problems, such as persistent racial discrimination and income inequality. The first cohort participated in intensive workshops addressing a range of issues including implicit bias, the use of force, children caught up in the criminal justice system, overcriminalization, homelessness and poverty. Five Georgetown Law professors lead Georgetown Law’s Program on Innovative Policing, which launched the fellowship. With their deep expertise in criminal justice reform and policing, the professors also developed the fellowship’s curriculum. Professor Rosa Brooks, an MPD reserve officer and a former official in the Defense and State Departments, is working on a book on policing in the 21st century. Professor Paul Butler, a former prosecutor, is a sought-after expert on criminal justice and race. Associate Dean Kristin Henning has dedicated her career to juvenile justice, advocating for youths in the criminal justice system as a public defender, heading Georgetown Law’s Juvenile Justice Clinic as a professor and pushing for reform. Professor Christy Lopez previously headed the U.S. Department of Justice division that investigates systemic police misconduct and led the investigation into the Ferguson, Mo., Police Department following shooting of Michael Brown in 2014. She also led investigations in Chicago and Los Angeles. Professor Shon Hopwood has a unique perspective on the criminal justice system; a former federal prisoner, he studied the law in prison, went on to law school afterwards and has launched a career on prison reform. Georgetown Law students play an integral role in the fellowship as well. A project-based practicum, “Innovative Policing: From Theory to Practice,” gives students the chance to research best practices in police training and education and develop and lead fellowship instruction modules for academy recruits and new officers. They also develop ways to evaluate the impact of their training. “We’re trying to help each and every officer that’s part of this program police more effectively and more compassionately,” Lopez said. 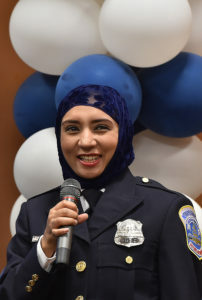 In fact, the Police Department has found the fellowship so valuable that it is incorporating the curriculum into its police academy, giving all new recruits — not just officers and staff selected for the fellowship program — a chance to learn about systemic issues that will affect their work. About 250 recruits go through MPD’s academy each year. The curriculum is also adaptable for use by other departments and has the potential to transform policing across the country. The idea is to spark discussions that “encourage all of us to think very fundamentally differently about policing,” Lopez said, noting the persistent racial and economic inequities that departments today don’t always take into account. Participants are dedicated to their new profession, Lopez said, but the challenge will be maintaining their public service spirit in the face of inevitable pressure and stress that comes with the job. 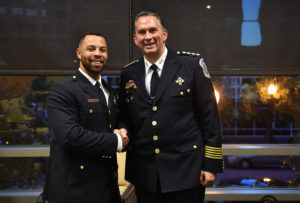 Officer Assanté Thomas, a new MPD member based out of its Fifth Police District, said connecting with other new officers serving different parts of the city helped him realize they’re all in the same boat.